I went to Mill Creek Farm for the snakes, but I stayed for the bugs. As an urban herper (reptile and amphibian enthusiast), I like to walk around green places looking under objects for critters. I had a great time with the small brown snakes I found at the Farm, located at 49th and Brown in West Philly, but I couldn’t help but be distracted by all the other wildlife. ‘Wildlife’ may make you think of wolves and moose, the charismatic megafauna you might expect to see at national parks out West. While you won’t find them in West Philly, wildlife still abounds. It is just on a smaller scale. Take the bees. Mill Creek Farm has hives of European honey bees, but on my first trip there five years ago, I also noticed small black native bees (maybe orchard, a.k.a. mason bees), zipping from flower to flower. A few weeks ago I visited the Mill Creek Farm with invertebrate enthusiast Dr. Kenneth Frank and photographer Christian Hunold. It was still April, so the only native bees we saw were carpenter bees working white apple blossoms and the yellow flowers of bolting kale. Frank pointed out the abdomens of the fat, black and yellow bees, shinier than bumblebees’. What really got our invertebrate fanatic excited was the scene under some old logs at the back fence. Gleaming brown centipedes, ferocious predators of their world, scurried out of the way. 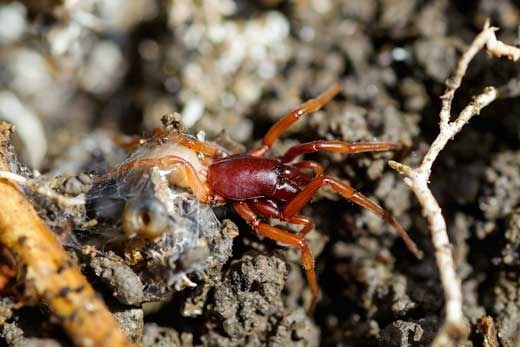 Isopods – little crustaceans better known as pill bugs, sow bugs, or roly-polies — lumbered under cover along with millipedes and beetle larvae. Frank pointed out a brown spider with enormous fangs. Harmless to humans, it uses its heavy weaponry to punch through isopod armor. These isopod eaters came over from Europe with their prey, exemplifying the native/exotic mix inherent to a vegetable garden. We had been invited to help the Farm’s director Johanna Rosen document what lives there. On an earlier trip, accompanied by Academy of Natural Sciences botanist and ecologist David Hewitt and birder and environmental educator Tony Croasdale, we turned up a few native bird species, like song sparrows, as well as a carpet of non-native weeds with evocative names like henbit and speedwell. Frank later praised these ‘weeds’: Bees they attract might stick around for the squash and adult wasps that drink their nectar might parasitize pernicious caterpillars. Either way we can find the sublime in the humble habitats of our gardens. There is nothing unique about what we found at Mill Creek. Keep your vacation plans to check out Yellowstone, but don’t ignore the drama and beauty beneath your tomatoes.